The 74ACT11008 contains four independent 2-input AND gates. It performs the Boolean function Y = A • B or Y = A + B in positive logic. The 74ACT11008 is characterized for operation from –40°C to 85°C. 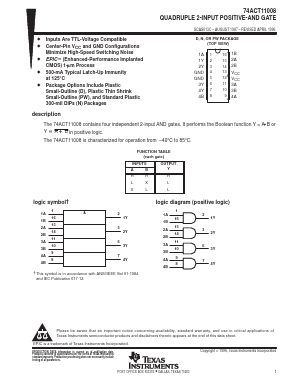 IN74ALS08D QUADRUPLE 2-INPUT POSITIVE-AND GATE View Integral Corp.